The Food and Drug Administration (FDA) has granted accelerated approval to Ibrance (palbociclib; Pfizer) capsules for the treatment of postmenopausal women with estrogen receptor (ER)-positive, human epidermal growth factor receptor 2 (HER2)-negative advanced breast cancer as initial endocrine-based therapy for their metastatic disease, in combination with letrozole. Ibrance is an inhibitor of cyclin-dependent kinase (CDK) 4 and 6. In vitro, palbociclib reduced cellular proliferation of ER-positive breast cancer cell lines by blocking progression of the cell from G1 into S phase of the cell cycle. 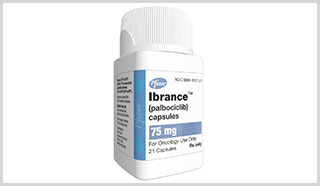 The efficacy of Ibrance was shown in a the PALOMA-1 clinical trial (n=165) of postmenopausal women with ER-positive, HER2-negative metastatic breast cancer who had not received previous treatment for advanced disease. Patients were randomized to receive Ibrance plus letrozole or letrozole alone. Study results showed patients in the Ibrance plus letrozole group had a progression-free survival of 20.2 months (95% CI: 13.8, 27.5) vs. 10.2 months (95% CI: 5.7, 12.6) in the letrozole only group (HR: 0.488; 95% CI: 0.319, 0.748). Overall response rate in patients with measurable disease was higher in the Ibrance plus letrozole group vs. letrozole alone group (55.4% vs. 39.4%). Data on overall survival is not available at this time. Ibrance is available in 125mg strength capsules in 21-count bottles to order through select specialty pharmacies. For more information call (800) 438-1985 or visit Ibrance.com.